I have a weakness for bows. You may not believe me, but buying handmade baby bows can quickly become an experiment in competitive shopping with people setting alarms because they know inventory will sell out in minutes. It’s what I imagine a New York sample sale is like but instead of designer dresses we’re talking about nylon headbands and alligator clips. It’s insane! When I found out about Little Poppy Co., I loved the non-competitive subscription-based premise. Sign up and for $11/month ($15 with shipping) you receive three seasonal bows in the mail. The Little Poppy Co. June bows include one hand-tied linen bow and two ribbon bows. 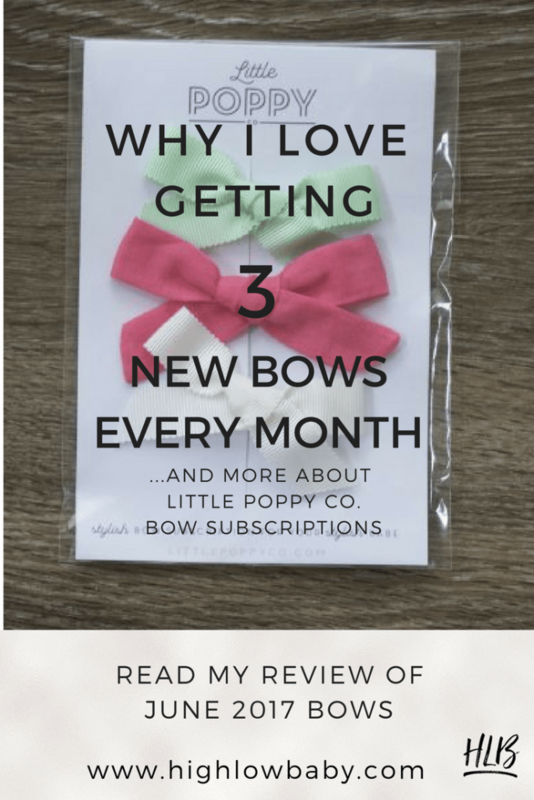 I think a Little Poppy Co. subscription is perfect for anyone that’s a little bit obsessed with bows (like me). But I also think it’s an absolutely darling gift. I’d love to give a Little Poppy subscription at a baby shower or as a first birthday gift. And bows are a darling stocking stuffer at Christmas. They have several gift options in the shop. Can you tell it’s really not hard for me to justify buying bows? Speaking of the shop, Little Poppy runs an exclusive shop for add-ons you can order on top of the regular subscription bows. This where that competitive shopping element comes in sometimes. 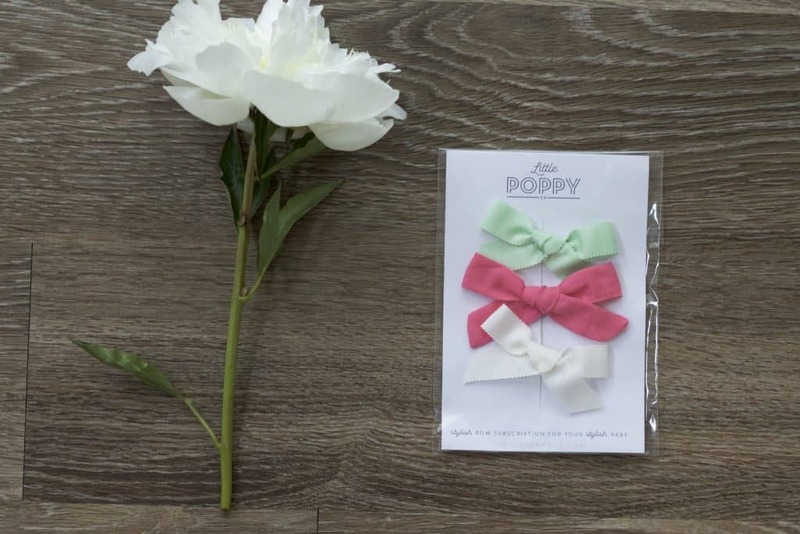 Little Poppy announces their exclusive bows on Instagram, and they often sell out very quickly. This month they offered a palm print bow that I really wanted to go with my Little Poppy Co. June bows but they get snatched up fast. In the shop they also sell pigtail sets in case you want two of each bow for an additional fee. We’re not quite to the pigtail stage, so I haven’t tried that out yet. Like most subscription boxes, the biggest downfall is that you’re not picking out what you’re paying for. Sometimes you get three bows that you’re bananas about, sometimes you might only like one. The nice thing is that unlike many subscription services, you’ll get to see what the bows look like before they arrive through the monthly reveals on Instagram. That always gets me excited about checking my mail! In general it seems like Little Poppy is striving to please everyone by increasing the quality of their bows, offering a wide range of colors (so you’re not stuck with 36 pink bows, for example), and a mix of different bow styles. I’ve loved introducing new styles into my bow collection. Before subscribing I was leaning heavily on the classic “schoolgirl” style bow. I loved all three bows that came in my June subscription! I decided to try out alligator clips for the first time, so we’ll see how that goes. So let’s talk about my Little Poppy Co. June bows! Aside from a few wipeable bibs, I think this is the very first hot pink item I’ve introduced into my child’s wardrobe! Sometimes hot pink feels too Barbie to me, but hot pink linen feels a bit more sophisticated. If you’re uncomfortable with hot pink, maybe think of it as flamingo? Now that I think about it, I think “flamingo” pairs well with basically everything. Love. I can do hot pink/flamingo/flagrant fuschia in small doses. According to their IG, Little Poppy has improved their classic ribbon bows by making them a bit thicker. While I’m definitely partial to hand-tied sewn fabric bows, I do like this style. My daughter doesn’t wear a lot of mint, but it will be fun to experiment with as an accent color. Can you go wrong with a white bow? We have one other white bow, and it’s not looking so pristine anymore. You can never have too many white bows. Yet, I think this is actually the first white bow I’ve received from Little Poppy because they’re so good at giving subscribers a variety of colors and fabrics. I love that the Little Poppy Co. June bows are classic and summery. It’s a really darling gelato-inspired palette and I think I’ll have fun playing around with these new accents. If you’d like to see more style posts, you can read about my favorite organic cotton pajamas for babies and my experience with Freshly Picked moccasins.